In his two part series, posted on Active History earlier this month, Stéphane Lévesque puts forward a “new approach” to considering the role of historical monuments as an object of study in history education. That approach frames the pedagogy of historical monuments as a historiographical problem that can be best approached using the tools of historical thinking. Following Jörn Rüsen, Levesque described the role of education as helping students become more sophisticated thinkers by drawing together the knowledge of history, and the knowledge of how history is produced and contested. In that framework, the ultimate goal of history education is to move students towards a genetic historical consciousness, marked by a dispassionate understanding of change over time, and a reflective self-awareness of one’s own perceptions of that change. I agree that goal is a worthy one, and that it is at times a good basis from which to design inquiry into public monuments that represent difficult histories.1 In a time when deeply divisive politics have reduced truth to an expression of identification, the educational goal of moving towards greater care for truth, dispassionate analysis, and critical self-awareness is very appealing, and at times necessary. Moreover, school is, perhaps, the only institution in which the young can apprentice into disciplinary modes of thought that may encourage more empathetic dispositions towards others. 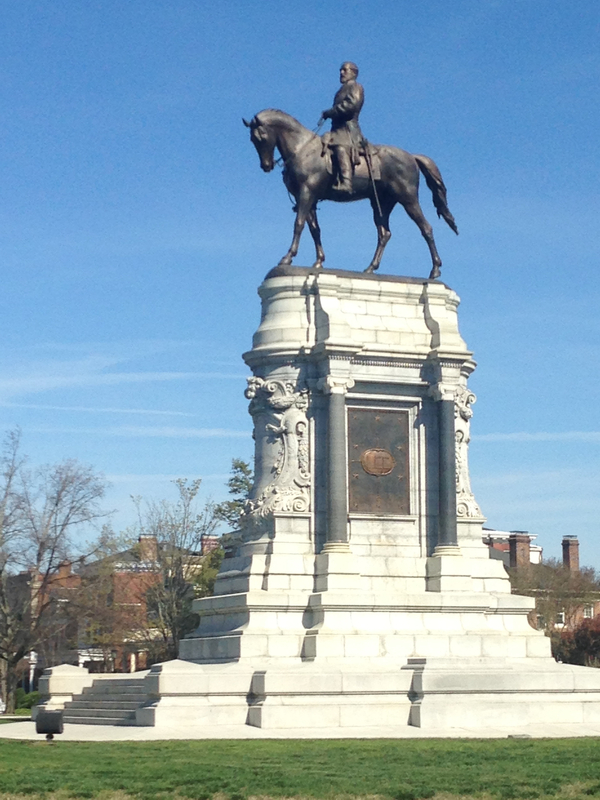 Monument to Confederate General Robert E. Lee, Richmond, Virginia. Photo by Melanie Buffington. I will argue here, however, that in the case of controversial monuments, pedagogical goals should equally consider how democratic politics work, the affective dimension of history education, and the social, cultural, and political context in which one is teaching. Monuments from the modern era were erected as the symbolic manifestation of that emotional need.6 Fights over the continued existence of monuments to past leaders who enacted overtly racist policies are fights over whose emotions matter, and who counts as fully human in our public spaces. Affect should not be ignored nor overcome in an instructional unit on a difficult history that evokes students’ identities. Finally, teachers should consider who is in their classroom and in the community around their school when considering the ends of an inquiry into contentious monuments. Monuments that are contended today are controversial because they represent political positions that were hostile to groups of people. Are the students in one’s classroom connected through their identities to those that support or oppose the continued existence of such monuments? What positions are likely to be in the majority and in the minority in the classroom? What positions hold sway in this community? How open are those with power to consider the positions of those with less power? The answers to those questions suggest different learning goals and the pedagogical approaches and activities that support those goals. Consideration of the social context, particularly local power arrangements, reminds us that decisions about how to approach monuments that represent ideologies of inequality have a crucial ethical dimension. Monuments like those to leaders of the Confederacy in the U.S., to Macdonald in Canada, or to Cecil Rhodes in South Africa exist in public spaces such as parks, courts, and schools that are today legally committed to the values of equality and public access. Their continued presence erodes the legitimacy of those spaces for many people who use them and who by right should expect equal treatment within them. This brings us back to the goal of genetic historical consciousness. That goal is largely congruent with the portrait of model citizenship by cosmopolitan political philosophers like Kwame Anthony Appiah and Martha Nussbaum.7 If we hold, as they do, that equality is a condition of greater flourishing, then how do we teach about monuments that represent the maintenance of unequal power arrangements? More difficult still, how do we contend with such arrangements when many people have invested affective resources to protect such symbols as their connection to the past (i.e. their heritage), and for whom reactions against the symbol are taken so personally? If a teacher’s students take such monuments for granted and cannot understand why others feel oppressed by their presence, then the greater ethical imperative is to help those students come to terms honestly with the reasons why the monuments were erected and to untangle the complicated feelings of their community and other communities regarding them. If a teacher is working with students whose positions have historically not counted for much regarding who is memorialized in their city, then the wise course for a teacher should be somewhat different. It is still important to learn why the monuments were erected, and why others have such a strong emotional attachment to them. However, it is equally important to help those students to excavate their perhaps unexplored affective reactions to the monuments and to help them articulate those emotions effectively in the public sphere. Those two classrooms demand that a teacher prepare for a different kind of affective work. Classrooms that are more heterogeneous will require different considerations, particularly around emotional reactions of the students to each other and how that might exacerbate conflicts that are present in the school or simmering under the surface. Levesque’s framework is a useful reminder that development towards a more sophisticated historical consciousness is related to an emerging understanding of how histories are produced. Nevertheless, teachers teach students first and content second. Those students live in an increasingly volatile and confusing world, a world that they will need to engage in at times with passion and at others with reason. If we are to be helpful to students and their teachers, we would be wise to consider their needs and contexts. Gabriel A. Reich is an Associate Professor of secondary history education at Virginia Commonwealth University. 1 Mandy Tompkins Gibson and Gabriel A. Reich, Confederate Monuments: Heritage, Racism, Anachronism, and Who Gets to Decide? Social Education81 (November 2017) 6, 356–61. 2 For a cognitive model of political communication, see George Lakoff. Moral Politics: How Liberals and Conservatives Think(Chicago, IL: University of Chicago Press, 2002). 3 For a history of the public sphere and political participation in it, see Jürgen Habermas, The Structural Transformation of the Public Sphere: An Inquiry into a Category of Bourgeois Society. Studies in Contemporary German Social Thought (Cambridge, MA: MIT Press, 1989). For a feminist critique of Habermas’s idealized public sphere, see Nancy Fraser, Rethinking the Public Sphere: A Contribution to the Critique of Actually Existing Democracy. Social Text(1990) 25/26, 56–80. 5 Yuval N. Harari, Sapiens: A Brief History of Humankind(New York, NY: Harper, 2014). 6 Erika Doss, Memorial Mania: Public Feeling in America(Chicago, IL: University of Chicago Press, 2010). 7 Kwame A. Appiah, Cosmopolitanism: Ethics in a World of Strangers(New York, NY: W.W. Norton & Co. 2006). Martha Nussbaum, Political emotions: why love matters for justice. (Cambridge, MA: The Belknap Press of Harvard University Press, 2013). I believe this is a sound approach to history education because it (1) acknowledges the importance of the public “cultural curriculum” that pervades students’ historical ideas (notably of contested community issues), and (2) draws on socioconstructivist learning – learners do no simply acquire information but construct meaning based on meaningful past experiences and cultural context. Students’ diverse emotional reactions to contested past lessons are thus central to successful learning. But their initial reactions, their emotions, their misconceptions should serve as the basis (not the end) for engaging them is more sophisticated ways of knowing and remembering the past. The fact that identity politics and power relations affect (determine?) how we remember and create sites of memory should be the subject of critical discussion and analysis so students learn how their classroom, community, and nation are never homogeneous and single-perspective despite what governments and lobby groups claim. But some narrative visions are more powerful than others. Genetic types of historical consciousness can entertain more complex visions of history and commemoration, understand that forms of commemoration (such as monuments) draw on different contexts and perspectives which change/evolve over time, and finally draw attention to how such commemorations might be improved (now and in the future). From this view, I think the role of educators (in the U.S. or elsewhere) should not be to promote one narrative standpoint but to offer learning opportunities to develop more complex narrative representations for 21st century democratic community building – or what we call in French « vivre-ensemble ».